Deborah Levison is an award-winning journalist, publicist and storyteller, and also, a child of Holocaust survivors. Born and raised in Canada, she attended the Royal Conservatory of Music and University of Toronto. She now lives in Connecticut with one husband, one dog, and three children. Visit her at www.debbielevison.com. 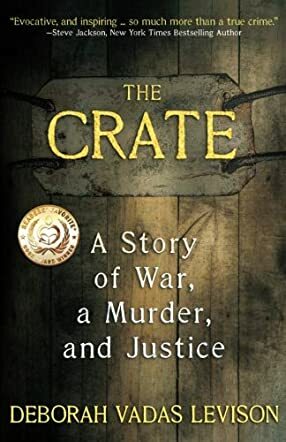 The Crate: A Story of War, a Murder, and Justice by Deborah Levison is a true crime story that started with the discovery of a crate under the crawl spaces of a cottage owned by the Vadas family in July 2010. In the first part of the book, Levison tells how she received the news from her older brother, Dr. Peter Vadas. She reflects on her family's move from Canada to the U.S., her memories of the close-knit community of Hungarian Jews in Toronto, and how her parents bought land and built a cozy cottage in Muskoka, Ontario. In the second part of The Crate, readers are told more about Levison’s parents surviving the Nazi brutality in WWII, while unraveling the gruesome murder, the identity of the victim, and the man responsible for it. The narrative shifts back and forth between the old memories, her childhood, her parents’ past, and the murder investigation, including how the family coped with it. The tangential style of the narrative might slightly disrupt the pace for some readers, but it always returns to the subject matter at hand with clear prose. It’s not hard to understand Levison’s nostalgic connection to the cottage. All the thoughts, care and hard work that had been put into the cottage, the summer memories of family spending time there together are instantly defiled by a gruesome act. The Crate－albeit combined with fond and poignant memories of the Vadas family－is a true crime story with disturbing details. It’s a tough topic to contemplate and a grim reminder of the worst of humanity.